After a long wait since November 2007, I got news that Kanebo’s new makeup line Coffret D’or has finally reached Malaysia! I finally had the time to check it out and overall, I’d say its all pretty good! These are all the Coffret D’or products for now. As Coffret D’or is still so new, I’m told that they will be sold side by side with whatever is remaining of T’estimo. The Coffret D’or foundation and base makeup isn’t available here yet so Revue will continue to fill this niche. Coffret D’or eyeshadows (RM120) are only available in palettes for now. There are 5 palettes and I own 02 Fresh – the blue-green one. There is a brief run down of the other 4 palettes and more reviews of products after the jump. 01 – Sweet – sweet pink, light pink and dark eggplant purple with white highlight. These are some color swatches I managed to take of the eyeshadows (Elegance, Stylish and Cool), 2 lipsticks and the shiny bit at the top is a spot of gloss. The eyeshadows are all shimmery but not glittery. It is actually quite pigmented but I find that the darkest shades tend to be a little gritty. The other shades are really wonderful – fine and go on smoothly. I’d been eyeing Elegance ever since reading PJ’s review and now that I’ve tried it, I know I’d probably get it! Now that T’estimo is discontinued, along with my favourite lipsticks from this line, I was keen to know if Coffret D’or’s lipsticks will live up to T’estimo’s. From a preliminary view, I’d say they do, and more! There is quite a wide range of lip colours and I swatched a couple to test them. The Coffret D’or lipsticks (RM86) are all marked Glow. I saw that a majority were shimmery (on the right of the counter) although there was one or two that did not have shimmer (on the left). The colours are more pigmented than T’estimo’s lipsticks and the shimmer is really pretty. No chunky glitter at all. I can see myself owning one or two some day. The lipglosses have a wand applicator with an angled sponge. I swiped a couple of colours but all just looked clear on my hand. The texture feels thick but not sticky. I can’t really see myself owning any because I’m not really that into lipglosses, especially those without colour. The tubes at the back are – mascara base, volume mascara and plain mascara; eye liner and glitter eye liner. The pen eyeliner was pretty impressive. It is a felt tip pen and draws a nice thin line. The colour isn’t very dark but it doesn’t budge an inch! I tried wiping it off and it wouldn’t budge until I got home and washed it off with soap. Pretty impressive! There was glitter eyelinertoo which I was quite fascinated with although I’m not sure how to use it. It is in a little tube with a felt tip pen style applicator in the cap. There are 2 colours – clear glitter and brown glitter. Both go on sheer and glittery and also don’t budge at all. The 4 colours in the front of the display are the Coffret D’or blushes – PK-22 (sweet pink), OR-22 (peach), BE-15 (beige peach) and RS-17 (rose pink). OR-22 and BE-15 didn’t really show up when I swiped it on my hand. PK-22 shows up as a light pink and RS-17 was the most pigmented of all. All the blushes have shimmer which I like. I think they retail for RM60+. 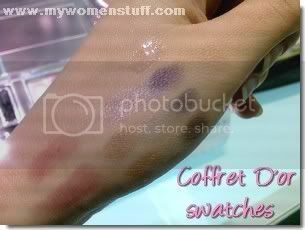 Where can I get Coffret D’or? Coffret D’or will be available at all Kanebo International counters and Kanebo International Salons soon. I’m told that there will be a product launch at The Gardens Midvalley from March 31st (subject to change) and there will be gifts with purchase – tempting eh? I managed to play with all the products but I couldn’t buy anything because the products aren’t in stock yet! Pity. I really had my heart set on that Elegance eyeshadow palette! How would you compare Coffret D’or and Lunasol? What are the differences between these two? Shirley: I’d say off the bat that they are quite different. I’ll try to do a side by side comparison soon. Stay tuned! I really want to try some of the Japenese cosmetics lines!